Save for my teeny tiny in comparison to the wall space Vogue Mirror, our tan walls go as far as the eye can see. We lucked out with such a large sized bedroom. Plenty o' room for our queen bed, nightstands, side chair, dresser, etc. 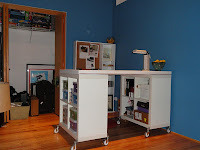 This meant I did not have to get rid of my black Target desk when we moved in. The desk currently holds jewelry boxes, my change box and various pieces of mail and coupons. The chair currently n holds, well, usually you can find half of my purses hanging off of the back of this $20 IKEA find, threatening to topple it over at any second. My "Project for March" includes creating His n Hers sections of the desk. 2 trays with desk accessories that are personalized for mine and Bob's needs. We don't want the guest bedroom to turn into a shrine of our unpaid bills but he feng shui follower in me does not love the idea of money management in the bedroom (that can't be good chi). However, I think it is going to be a better option than their current home on the kitchen counter. The wall space above the desk can also be divided into 2 sections: a board for Bob's stuff and another to hang my jewelry. I've seen a couple incarnations of jewelry cork boards; an example here. I have fun jewelry but never think to wear them so hopefully staring right at some of the options would do me well. My Malm bed amazingly survived the move - although I would be lying if I said there wasn't a stack of phone books holding up a piece in the middle of the bed we just couldn't figure out upon reassembly. So while "a place to sleep" is checked off the list, the prospect of a king sized bed with luxe sheets has been burrowing in our brains. Fiinances considered, this will not be a "Project for March" but rather a "Project for Q3/Q4!" Overstock has so many great sets of 700+ thread count sheets for decent prices and I feel like you have to work rather hard to find a mattress NOT on sale. Additional costs to consider upgrading my feather bed and down comforter from queen to king, mattress pad, new pillows and - oh yeah - the bed frame itself! 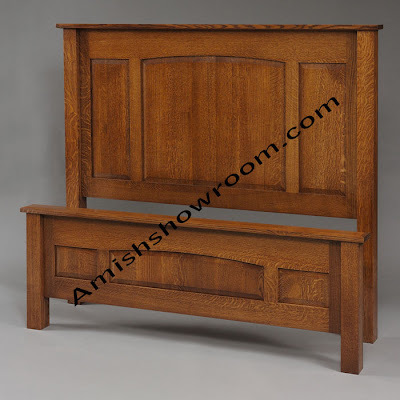 Loving the look of this Amish bed. Now that's quality. Mornings are less fun when your feet have to touch the hardwood when you roll out of bed in the morning. At least winter is nearing its end so hopefully the temperature of said floor will drift above freezing. Still having some issues with how much rugs cost, and thinking about how much of an 8x10 rug would be wasted underneath the bed, we are considering our options. Just get runners? Get FLOR tiles and only line the visual parts outside the bed? Shaggy or Sheepskin? This is also going to be a "later on" project - although if the right rug comes along before the end of the year we better not pass it up! Rather than leave you with images of an unfinished mess of a bedroom. I would like to share some of the areas that we have already tackled and are pretty happy with as is. Neither of us had a dresser at our old places: Bob relied on laundry baskets and his closet shelves and I had a collection of open totes from Bed, Bath and Beyond. We fell in love with this dresser at Oak City Furniture in the burbs when we tagged along with my sister and brother-in-law on their hunt for a dining room table. Since it was in the "back room" a sale price of $500 was already applied but I wish I had been a bit more negotiation-savvy and gotten the price down further. Next time. Sitting on top of the dresser is our new 40" Vizio flat screen. Some may say a bit excessive for a bedroom, but the room is so large the bigger screen actually makes sense. Of course, upgrading to an HD DirectTV receiver has proved necessary as the picture quality loses its luster on an HDTV. This purchase allowed us to say buh-bye to Bob's old 27" set. Trying to sell that bad boy on Craigslist, its currently taking up space in the guest bedroom. The dark wood of the dresser transfers over to the nightstands we purchased off of Overstock.com. Actually meant to be end tables, each was $150 and with $2.95 flat rate shipping this meant we were saving on having to fit 2 huge boxes in our little car AND the exorbitant sales tax here in Chicago. The lamps are $10 IKEA purchases. They give off good lighting and their slim design makes it seem like they are barely there. I like how the open space between the top and drawer allow for easy access to books and remotes without having to clutter the table top. I picked up two storage ottomans for $20 each at Bed, Bath and Beyond a couple years ago and they form a nice bench at the end of the bed. We can also bring these out to the living room when we need extra seating. Finally, our Mongstad Mirror. After months of coveting this from IKEA, the $99 mirror (yes, $99) made its home against an open wall between the bathroom and the closet. It is great when the sun shines in from the opposite window and reflects off of the mirror. I have finally started to see the sun in the last few days - ready for winter to be over! Although it looks like it is precariously leaning against the wall and could fall at any moment (that would equal out to about 70 years of bad luck, I think), is is actually screwed into the wall at the base and the top. Just enough space for the cats to crawl through - although Fredo has been chunking up pretty quickly, we're going to find him stuck in there one of these days! Well, that wraps up the Room by Room series - at least in its first incarnation. I'm sure to be back with updates on how rooms are progressing and soon enough we'll move to another place with new rooms to fill up. . .hopefully not too soon though. We're still settling in!